Do you have a Chocolate Allergy? Not many people genuinely suffer from a chocolate allergy. That is not to say that you don't have a reaction to eating chocolate. The question is whether or not you are truly allergic. Headaches are commonly blamed on the consumption of chocolate. In reality, it may not be the chocolate at all. You may actually be reacting to one of the other ingredients in your chocolate candy treat. Could it be that you are instead sensitive to the milk products, soy beans, nuts, corn syrup, or gluten? 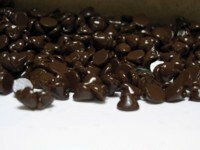 You may want to experiment with a higher quality of chocolate that contains a greater percentage of cocoa solids. Take special note of the other ingredients. You may find, to your delight, that it doesn't bother you like some of the other chocolate candy available. That would be great news. No doubt there are some who are, in fact, allergic to the chocolate cocoa itself. If so, you have my sincerest sympathies. If that is your situation, I suppose I must counsel you to avoid chocolate, if possible. I have a hard time saying that, but the suffering may just not be worth it. There is not really very much caffeine in chocolate, but there are many other chemicals that may be setting your system off balance. For some of us, it may be to those chemicals that we can attribute that lovely feeling that comes from enjoying a taste of chocolate. They may also be responsible for the irritability or depression that some experience after splurging. I guess we all need to pay closer attention to how what we eat affects us. I am terrible about this. I tend to swan through life oblivious to my body's system until, of course, it reacts to something and causes me a bit of pain. Then I have to figure out afterward what in the world went wrong. If you do suffer from what you suspect may be a chocolate allergy, I encourage you to experiment a bit and see if it just might be something else. If worse comes to worse, you may decide to be tested officially to determine if your suspicions are true. In the end, you may be better off avoiding chocolate altogether. Of course, I would only suggest that as an absolute last resort! :) Best of luck!